Cocksfoot grass (Dactylis glomerata) was sown on the Banks Peninsula hills by the Hay family of Pigeon Bay. Harvesting the seed was hard work, as it had to be done by hand. 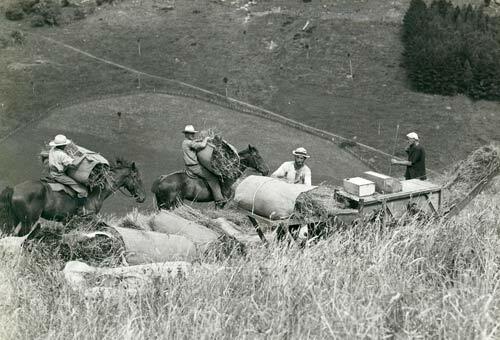 First, the grass was cut with scythes, then it was bundled into sheaves and carried by horse to the threshing location. Here it is being threshed by a machine, but prior to the 1860s threshing was done by hand with a flail. The industry died out in the 1930s when a disease attacked the crop, and also because harvesting of cocksfoot was able to be done more cheaply on the plains.